BY JIM DOOLEY – Arizona prosecutors are seeking the death penalty for two Hawaii prison inmates charged with murdering another prisoner from Hawaii while all three were incarcerated in a privately-run prison in Arizona. officials and the Corrections Corp. of America, operator of the Arizona prison, Saguaro Correction Center, alleging that their negligence contributed to Nunuha’s death. Court records filed here and in Arizona show that the two men charged with murdering Nunuha, Miti Maugaotega Jr., 26, and Micah Kanahele, 31, are facing execution if convicted in Pinal County Superior Court. initials of his assailants’ prison gang were carved into his chest. The murder was committed inside a prison. Nunuha, 26, had served more than four years of a five-year sentence for burglary and property damage. Maugaotega and Kanahale were serving life sentences for murder and other violent crimes. Hawaii, which has no death penalty, pays Corrections Corp. of America some $10 million annually to house up to 1,800 inmates at its Arizona prisons. Corrections Corp. of America and Hawaii state officials have denied liability for Nunuha’s death. Several months after Nunuha was murdered in February 2010, another Hawaii inmate, Clifford Medina, 23, was strangled to death in his Saguaro cell. 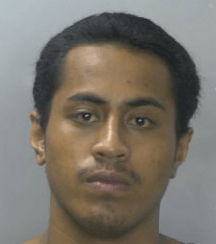 The assailant was his cellmate, Mahina Silva, now 23, also from Hawaii. Prosecutors did not seek the death penalty for Silva, who pleaded guilty in the case last year, according to Arizona records. The death penalty is never the right punishment. It should be outlawed. We can't pretend we are God! Death penalty is outrageous, no matter what the crime is. We can't take people's life and call it justice.